A rare diamond makes a rare ring. 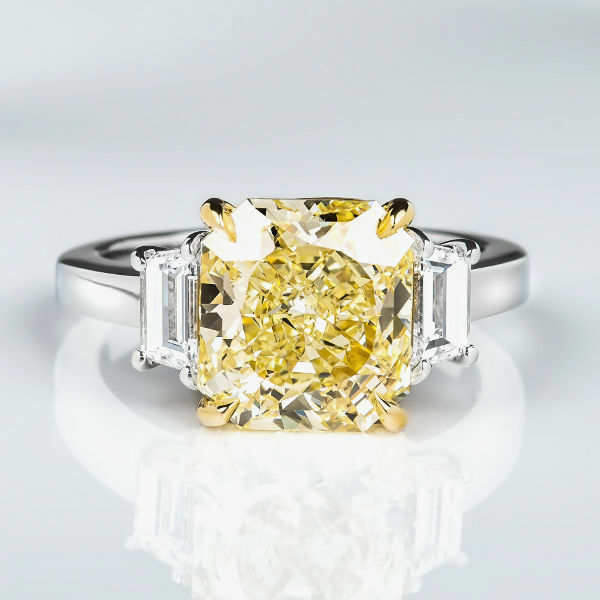 Three stone yellow diamond ring, with a 4.13 carat center diamond that was graded by the GIA as an Internally Flawless fancy yellow diamond with no fluorescence. It is flanked by two F-G color trapezoids with VS clarity weighing 0.64 carat bringing this ring’s total carat weight to 4.77 carats. The shank is made out of platinum and the crown is made of 18k yellow gold in order to enhance the yellow color diamond even more.